SMARThome.eu :: How to make your home intelligent? 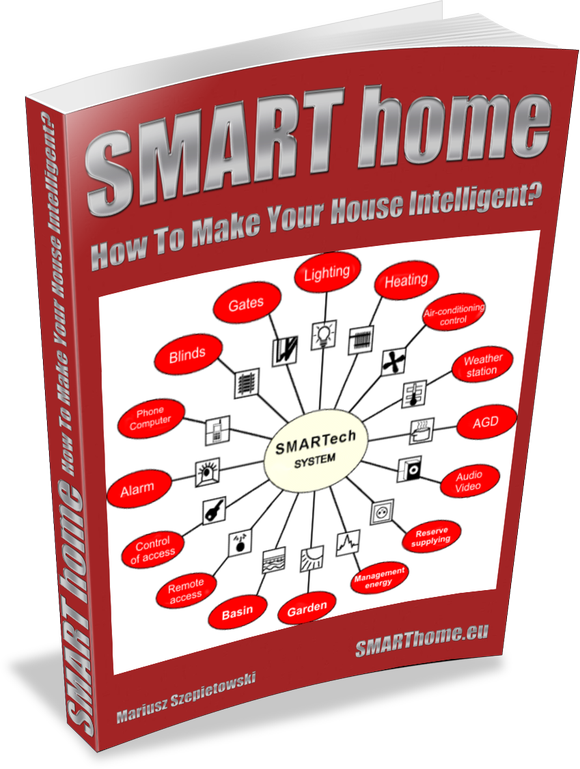 SMARThome.eu / Offer / Guidebooks / How to make your home intelligent? How to make your home intelligent? 167 pages about modern intelligent homes. This topic is becoming more and more popular, even in mass media, but reliable and clear information is still lacking. Potential readers are bound to find shallow advertising texts or very technical descriptions. Our guide is different - it presents practical information, presented in an easily digestible way. For whom is this guide foreseen? The guide is targeted at persons building their house or flat. It will provide them with knowledge about what can be gained through usage of modern technology that remains unknown to a great many even though it had been in use for years. It will allow the reader to properly plan great lighting in his home, a home theatre system, and a music/film system in every room. 27 EUR – you only pay this much when buying the guide 'How to win customers for Premium products? ', gaining access to this material at any time and in any place! Now you can have all the most important information always at your fingertips. Trust over 12 years of experience of SMARTech specialists. Order your guide 'How to win customers for Premium products?' today for the special price of 47 EUR (the price rises with each new addition, present customers will receive all future updates, so it's worth buying quickly for a lower price). Our guide came to being on the basis of over 10 years of practice in constructing such systems. We know the expectations of people currently building houses - that they should be modern, safe, economic and comfortable. 1. What is an intelligent house? 2. Lighting in an intelligent house. 4. Control of the heating and air-conditioning. 5. Useful motion, energy and weather sensors. 7. Savings in an intelligent house. 8. Safety in an intelligent house. 9. A real cinema at home. 10. A cinema in a common room. 11. Multiroom and audio/video signal distribution. 13. Description of design phases. 14. Possibilities and functions of consoles. 17. Comparison of intelligent home automation systems. 18. How much do intelligent home systems cost? 19. Sample technical specifications of a KNX system. 20. Sample technical specifications of a home cinema and multiroom system. This offer is unique, as it is the only one. It is valuable, because every year, millions of houses and flats are built in Europe, and each owner would like their house/flat to be modern. Unsure whether this guide is for you? Or do you have doubts as to its value? Get a free sample fragments of this guide. Sign up! I am currently arranging my apartment from the plaster, so all these kinds of information are very valuable to me. As for the factual content, at first I thought that it will be too laconic, and that it's just about advertising these technology, but I have to say that one doesn't need more detailed descriptions for any purpose. It's fine as it is. Generally a very useful guidebook, people who are not up to their necks in architecture, interior design or construction will get to know the newest technologies, new solutions, and make use of them. The presented material is interesting, and the technical jargon does not cause me trouble, I know the construction industry fairly well, both from the practical and theoretical sides, and the presented interesting technical tips can be tried and tested at home. Don't waste time looking for information - order now your guide to modern installations and make use of precious tips as gathered and described by professionals.